13. House for the Pres. George Washington, finally a private citizen, died unexpectedly at Mt. Vernon on December 14, 1799, at the age of 67. The stunning news plunged the country into deep mourning He was not entombed at Mt. Vernon until December 18th. To make sure that he was not buried alive Washington had requested that he not be put into the vault for at least three days. 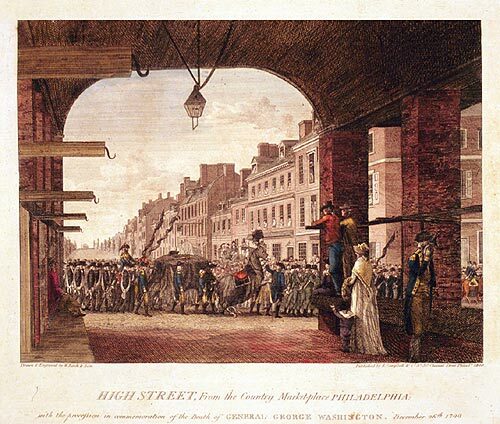 . . On the 26th of December, eight days after his funeral, by decree of Congress a memorial procession and service took place in Philadelphia the capital. The procession formed at the State House (Independence Hall). Military organizations and the clergy slowly marched ahead of a symbolically riderless horse and a draped empty bier. Members of Congress followed in parade to the New (Zion) Lutheran Church at Fourth near Arch. There the service was led by the venerable Bishop White, the rector of Christ Church. Rep. Henry Lee - "Light Horse Harry" delivered the funeral oration describing Washington as "first in war, first in peace and first in the hearts of his countrymen..."(see commentary, Plate 6). On December 18, 1999, to mark the two hundredth anniversary of Washington's funeral, there was a reenactment of the memorial ceremonies that took place in Philadelphia on December 26, 1799. 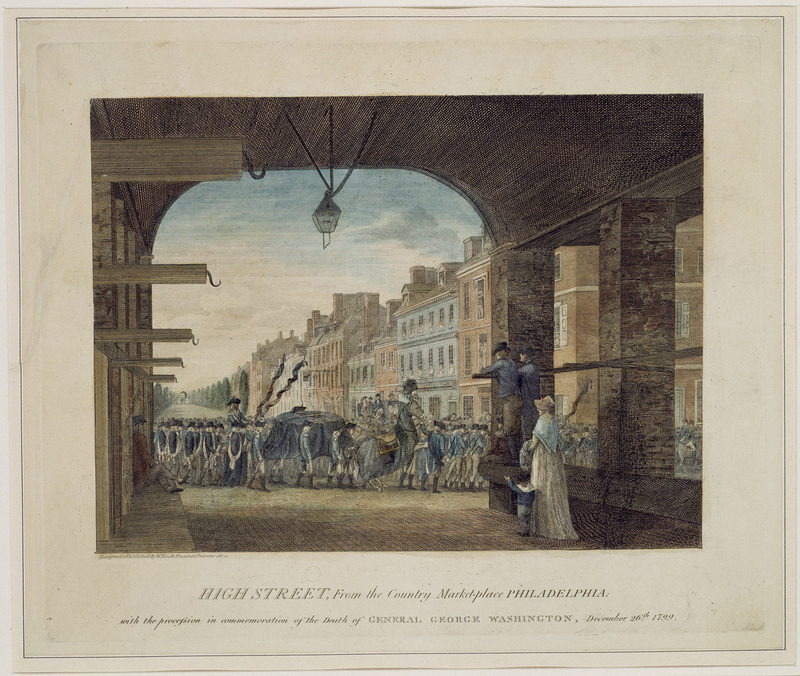 The reenactor's procession passed in front of the library of the American Philosophical Society on South Fifth Street (see 2000 photograph, Plate 19), and then proceeded eastwardly along Market Street. Because the New Lutheran Church (Zion) on Fourth Street, had long been demolished, the procession continued to Christ Church on North Second Street for a memorial service. 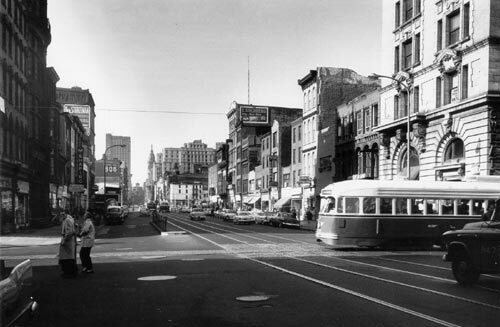 About 1970, the buildings between Fourth and Fifth on both sides of Market Street were razed. On the north side, the Philadelphia National Plaza building (now First Union) was built 1970, and in 1967 a new U.S. Courthouse and Federal Building was opened between Sixth and Seventh. At Eleventh, the Aramark Towers (formerly ARA), built 1987, hides from view the former Headhouse of the Reading Railroad, built 1893, restored and opened as a hotel (Marriott annex), in 1999, and the new Marriott Hotel between Twelfth and Thirteenth, opened in 1995. On the south side of Market between Fourth and Fifth, is the Continental Building, built 1970, and the studios and offices of KYW and KYW-TV Channel 3, opened in 1972. At Sixth Street, overlooking Independence Mall, is the Rohm and Haas corporate headquarters, built 1964. At Twelfth and Market the celebrated Philadelphia Savings Fund Society Building, designed by architects George Howe and William Lescaze, was completed in 1932. 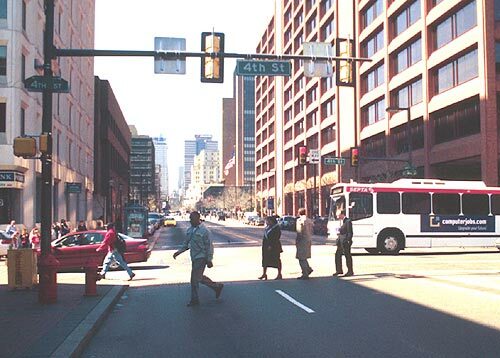 In 2000 it opened as the Loews Philadelphia Hotel.